Celebrate the New Year with us by treating yourself to something special from our January sale. 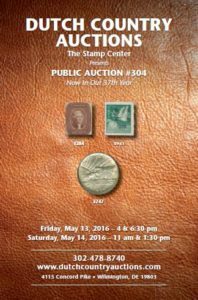 We have a wonderful range of individual items to large accumulations and lifetime collections of stamps U.S. and worldwide, covers of all types and quantities, Americana and coins/currency. In our cover section there is a nice variety of patriotic, advertising, air, rocket mail, naval, Zeppelin and many FDCs both U.S. & WW. 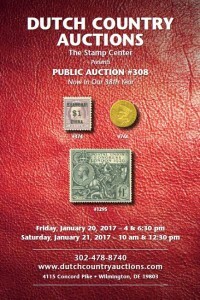 The U.S. stamps feature many choice singles including #1 (6 different), 120, 356, 832b, 15T49b booklet, RW31 PBK and much more as well as many large U.S. lots and collections. The highlights of the Americana are autographs of Amelia Earhart, Byrd, Eckner, Doolittle and many others. Continue Reading……. Our November sale is filled with great values on individual items, country collections and large lots. Our cover selection has many U.S. & WW large lots featuring a nice group of Karl Lewis handpainted covers, WW air covers, a wonderful #836 collection plus FDCs, postcards, Zepps and more. 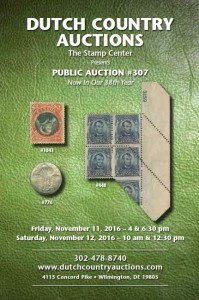 Among the United States singles is #112-122, 141, 154, Columbian dollar values, 263 and a complete booklet of 15T49B telegraph stamps! There are also many large lots and collections. We have almost 200 coin and currency lots including U.S. and worldwide items and many certified coins. Under our worldwide section we feature some rare stamps including Antigua #4a, Bechuanaland 7a, Canada FB53a, Newfoundland 7, New Brunswick 5, Cape of Good Hope 7a and much more. These are followed by a large selection of country collections and worldwide collections. There is something for everyone and much to choose from in our largest sale to date! 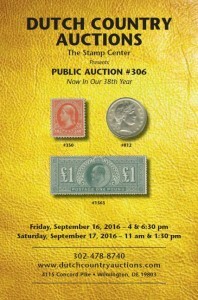 Our September sale is packed with a wide assortment of singles, sets and collections of stamps, coins, covers and ephemera. It starts with a very nice assortment of U.S. postal history and expands to include naval covers, Zeppelin Flights and U.S. and worldwide collections and accumulations. There is a nice group of Artcraft, a wide variety of Collins hand painted and an attractive group of Williams covers. We have a very strong showing of U.S. singles including an 85B, 137, 211 BK4, dollar Columbians and Trans-Mississippi 292 unused. The coin and currency items feature a nice selection of Morgan Dollars, Peace Dollars and Silver Certificates. Continue Reading…. Quality and Quantity – our July sale has both! Our cover section includes a very strong group of First Flights and a lifetime collection of Submarine Mail. There are many other U.S. and WW cover lots including topicals, Zeppelins and FDCs. There is also an excellent selection of postcards. Our U.S. singles section contains a nice #143 unused with certificate, 537a, 557a and 562b. 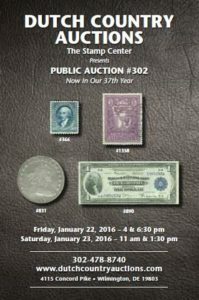 We also have over 200 lots of U.S. collections, accumulations and large lots. Our coin section features a strong group of Indian cents, a nice 1944 Double Die Lincoln cent and an extensive collection of Roman Empire ancient coins. We are pleased to announce that our May sale is again filled with diversity, value and large lots. Among the many cover lots are both quality single items like a China hand painted, A U.S. #610 FDC, Zeppelin covers, Vatican City, airs and many large lots including a Doane collection, naval and space plus U.S. and WW FDCs. Our U.S. section includes numerous #1s and 2s; also a #12 unused with cert, a #39 used w/ cert, unused #62b with cert, #196 unused with cert, #3261Pa-3262Pb (2 sets of plate proofs on coated and uncoated paper) and a host of collections, accumulations and large lots. 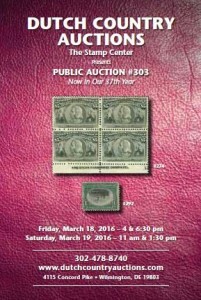 Dutch Country Auctions is pleased to announce that Auction #303 in March is loaded with many better values. 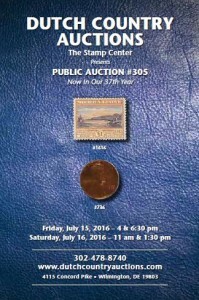 Right at the top of the list is a stunning imprint block of the $5 Columbian issue #245 with seldom seen centering! We also feature a nice copy of #294a, the One Cent Pan Am inverted center, followed by many better U.S. singles, sets and collections. As usual we have a strong showing of U.S. and WW covers (including FDCs and Zeppelins), coins, currency, and Americana. We are pleased to say that our January sale is filled with many interesting and valuable selections. From large lots to single items there is a great variety of choice items. Our cover section contains event, Christmas topics, military, Naval, Zeppelin, First Day and much more including a Balbo (Italy C27), Gandhi (India 203-206. There are also some extensive & comprehensive FDC collections. The U.S. singles feature Columbians to $5, Zeppelins, K1-K18, OX19-OW20, RW1-RW5 and much more. There is a strong showing of U.S. accumulations and collections as well. Some of the featured coins include a 1793 Wreath Cent, 1799 Bolender-16 Bust Dollar, and 1907 & 1908 $20 Gold pieces.